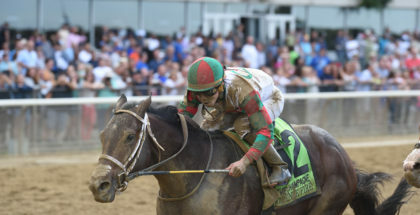 Long shot By the Moon wins Frizette and Pays Big (NYRA Press Release): Trainer Michelle Nevin earned her first Grade 1 victory on Saturday at Belmont Park when 24-1 long shot By the Moon outlasted a field of promising 2-year-old fillies in the Grade 1, $500,000 Frizette. By the Moon won the Frizette at Belmont Park on Saturday, October 4, 2014 for trainer Michelle Nevin. The victory gives By the Moon the opportunity to compete in the Breeders’ Cup Juvenile Fillies on Saturday, November 1, 2014. By the Moon broke on top under Jose Ortiz, but was content to let Grade 2 Adirondack winner Cavorting grab the early lead. 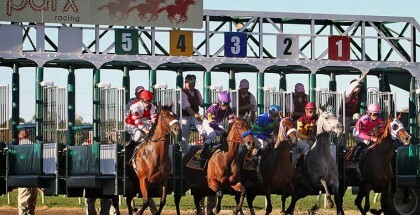 The Indian Charlie filly shadowed Cavorting through quick splits of 22.66 seconds for the opening quarter-mile and 46.11 for the half, as Grade 1 Spinaway Condo Commando winner loomed menacingly in third. With minimal urging, By the Moon inherited the lead turning for home and turned back all challengers to prevail by 2 ¼ lengths over Wonder Gal, and Feathered checked in third. 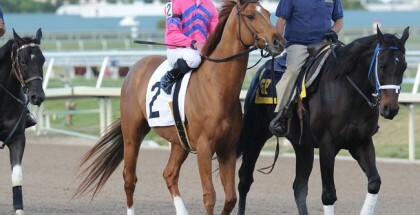 Condo Commando, the 4-5 favorite, finished fourth. The decision reversed the outcome of the Spinaway, in which By the Moon was beaten 13 ¼ lengths by Condo Commando at Saratoga Race Course. By the Moon completed the one-mile distance of the Frizette in 1:39.42, running her last quarter in a shade under 28 seconds over the sloppy, slow track. By the Moon’s win earned her an all-fees paid berth to the Grade 1 Breeders’ Cup Juvenile Fillies as part of the “Breeders’ Cup Win and You’re In” series. The dark bay or brown filly returned $50.50 on a $2 win bet and enhanced her bankroll to $419,800. Caymon Croc, Ring Knocker, and Cavorting completed the order of finish.